I first found Jana because of her funny, poignant memoir Flunking Sainthood: A Year of Breaking the Sabbath, Forgetting to Pray, and Still Loving My Neighbor, a book I highly recommend–both for its humor and inspiration. 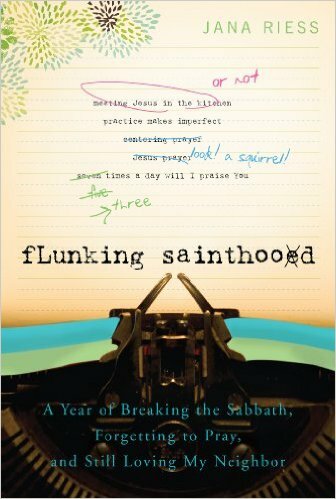 Six weeks after I turned in the manuscript for Flunking Sainthood, I received a surprising phone call. The father I had not seen or heard from in twenty-six years was dying in Mobile, Alabama. Could I come there to say good-bye? Oh, and one more little question: did I want the hospital to discontinue life support, since he was unresponsive and could not breathe on his own? I was stunned. The day took on a surreal feeling as I called my husband, called the nurse, called the social worker, called the airlines. His condition was bad, the hospital told me. The pulmonologist wasn’t sure if he would even last the night. He was “actively dying” now, having been in the hospital for thirteen days with a progressively worsening COPD, a form of emphysema brought on by decades of smoking.